Chivala beach is getting popular among the tourists due to its attractive arch shape and huge rocks at the background. 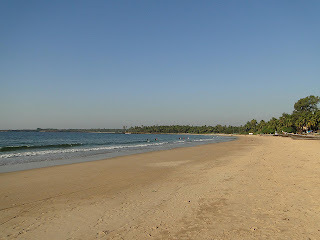 It is a sprawling stretch of golden sand and clean waters bordering Malvan in the North. Its proximity to Malvan town is one of its advantages compared to other beaches of Malvan. Earlier a silent fishing village in Sindhudurg district it has now become popular as the best beach to explore on the Malvan coast. Chivala beach in Malvan nurturing a fishing village in its vicinity, where small beautiful fishing boats adorned with different colored flags remains in memory for a longer period. One of the nearby attractions is the popular rock garden visited by many tourists during their Malvan visit. Another memorable attraction to be experienced here is the exotic sunset at the backdrop of palm lined beach. Visitors to Chivala love to stay in the traditional home stay accommodations available on the beachside. One of the classic home stays at a convenient location near beach provides perfect ambience and a homely feeling combined with warm Malvani hospitality. All this accompanied with a tasty Malvani cuisine is a treat for the tourists. Chivla beach hotels with well furnished rooms and executive facilities help in balancing requirements of tourists, which opt for a luxurious stay near the beach. Chivala beach resort is surrounded by pristine palm groves, which is a paradise for nature lovers, swimmers and sunbathers. Even there are a few beach cottages to stay offering a unique and incredible experience. Since the beach is located near Malvan city visitors are at liberty to stay in one of the hotels of the town, which are close to Chivala so that they can comfortably go around the Chivala beachfront. Some of the hotels near Chivala beach in Malvan are backed with in-house restaurants which are preferred by many visitors.